False alarm on disk health? If I check using Drive Monitor and 3 other drive checkers, health is 100%. Why is this? Still having these - no-one interested? Can you see in SMART parameters which value is below its threshold? Thanks for the reply - where woud I find this? Your capture is the right one. There are several values taken into Acronis Disk Health Calculation including "Power-On Time Count" and "Start/Stop Count". These values will probably raise and disk health calculation is maybe incorect. For modern SSD drives the WLC (Wear Level Count) is more interresting. Drive monitor was developed in 2010 and is not continued any more and doesn't respects the WLC attribute. In the second link is some explanation, the WLC raw value could reach 3000+ safely, your value is at 145, so far away from failing. Thats right, Drive Monitor cannot detect the "newer" attributes like WLC and was not designed for SSDs, in your case you can safely ignore the warning. I have exactly the same issue. The Acronis Drive Monitor lists one of my drives as deficient (46%) showing critical event: "Uncorrectable Sector Count". 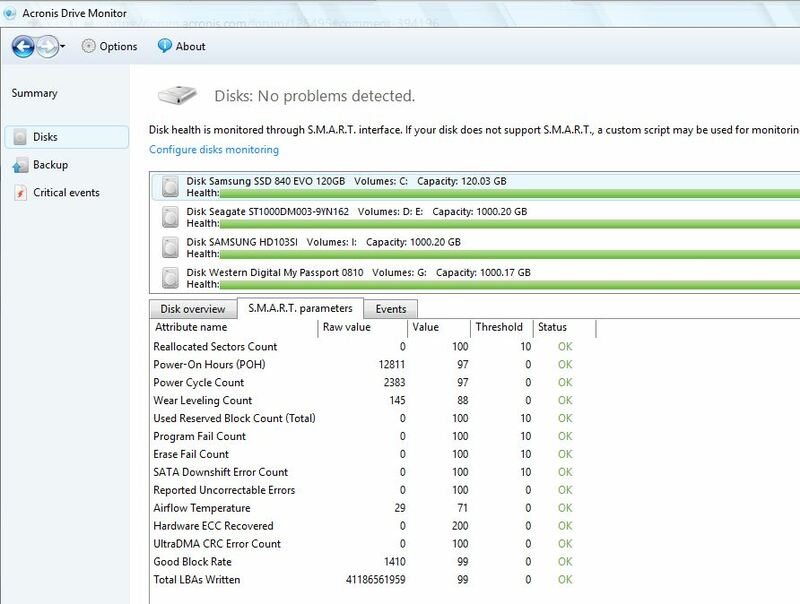 However, the Piriform Speccy tool shows the drive in perfect health with the S.M.A.R.T. data showing no problems. Then, I ran the Windows 10 Disk Check utility. This also finds no problems with this disk. Since there are no problems found, there is no option to repair the disk. I am suspicious that the Acronis Drive Monitor is creating false error reports. As been said earlier in this thread Disk Health is being calculated by ADM. Your WD drive shows a value in Uncorrectable Sector Count which can be repaired in most cases as long as enough spare sectors are present. I recommend the WD Data Lifeguard Diagnostics Tool to check your disk, it will generate an error report and may be helpful for further support by WD (replace the disk if warranty apply). Please do make a backup of your data prior running the WD Tool and/or repairing defective sectors. Thank you for this useful information. I shall definitely make use of it.